Pileus up to 9 cm, hemisperical, later flat-convex to convex, shiny, somewhat slightly viscid, reddish orange, vivid red to dark red, bluing strongly when bruised. 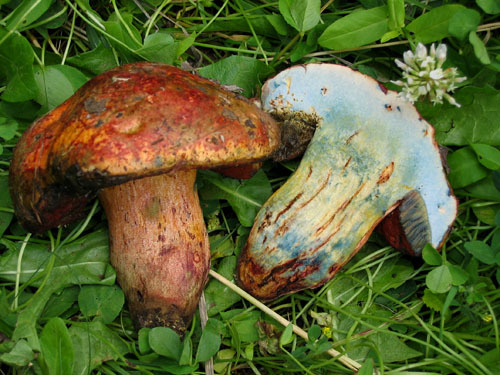 Stipe cylindric club-shaped, club-shaped to swollen, yellowish white, more bright yellow nearly the apex, covered throughout with fine light orange, orange, reddish orange or pastel red granules; surface bluing when bruised or handled. Flesh lemon yellow, strongly bluing when exposed to the air. Tubes lemon yellow, bluing when injured. 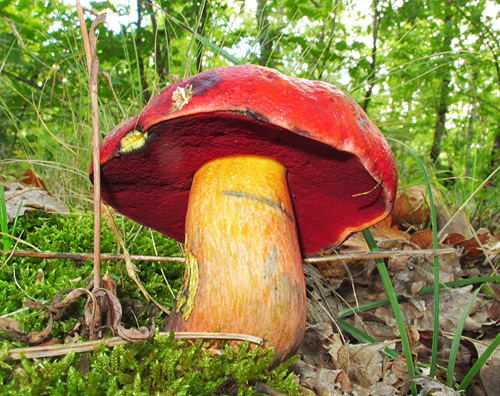 Pores bright red, orange to yellow nearly the cap margin, blue-black when bruised. Smell not distinctive. Taste not distinctive. 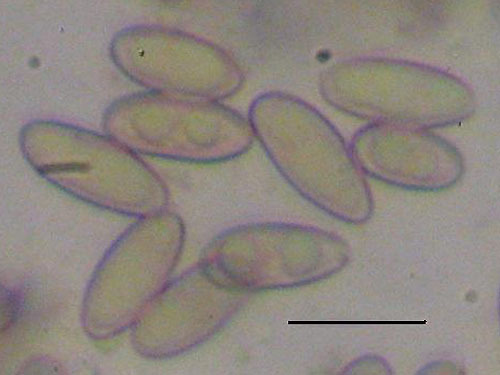 Basidiospores 11–12 × 4.5–5.5 μm, ratio 2–2.7. Pileipellis (the cap cuticle) a trichoderm of interwoven branched septate hyphae of long cylindrical cells. Microchemical reactions: no reaction observed with Melzer’s reagent. Habitat. Deciduous forests, mycorrhizal with oaks (Quercus). Distribution. More or less southern species. Records are available from Austria, Bulgaria, Croatia, Germany, France, Greece, Hungary, Italy, Russia, Serbia and Montenegro, Slovakia, Slovenia, Spain, Switzerland and Turkey. Extraeuropean findings are known from the Russian Far East and North America, however these encounters need confirmation for conspecificity by molecular techniques. 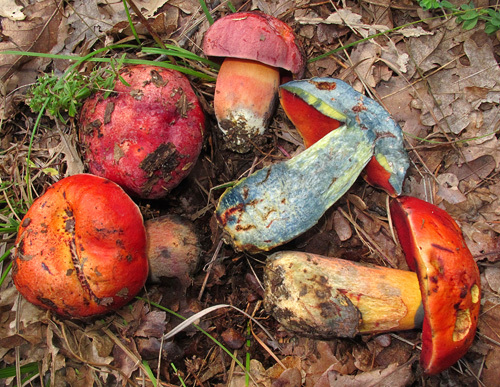 Boletus reichertii described from Israel seems very close to Boletus dupainii and needs further study. Boletud dupainii - detail of the granulated stipe surface. 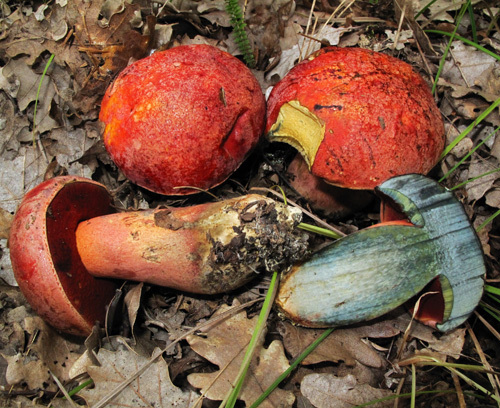 Boudier's illustration of Boletus dupainii accompanying the original description of the species. Boudier, J.L.É. 1902. 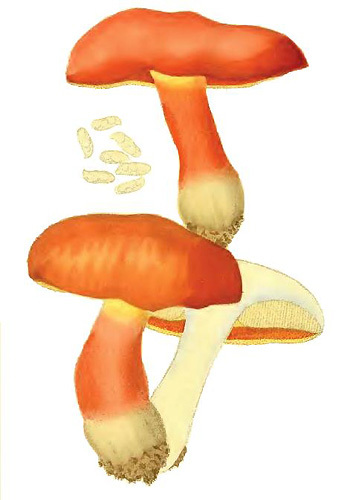 Champignons nouveaux de France. – Bulletin Trimestriel de la Société Mycologique de France 18: 137–146. McConnell, O.L. & Both, E.E. 2002. 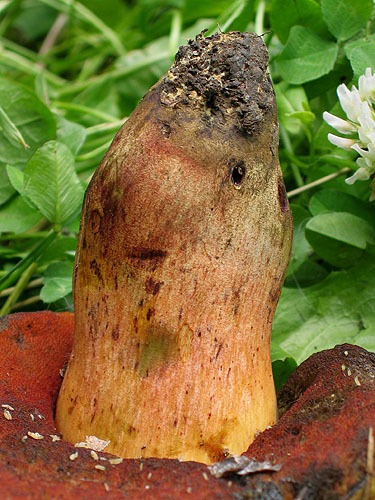 Boletus dupainii in North America. 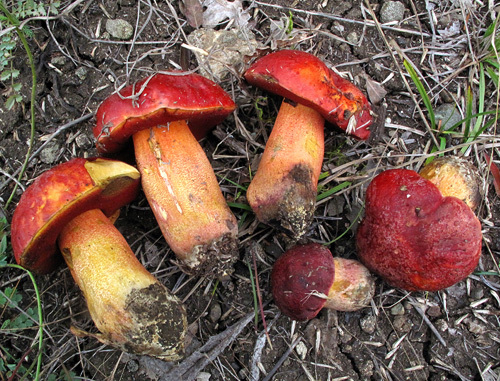 – Field Mycology 3: 14–15. Pilát, A. & Dermek, A. 1974. Hríbovité huby. 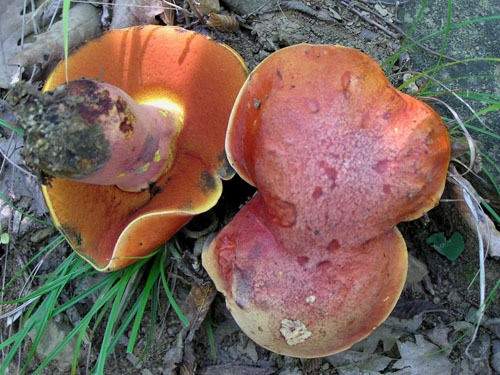 Československé hríbovité a sliziakovité huby (Boletaceae – Gomphidiaceae). Veda, Bratislava.